".... great positive attitude, it made me feel less tense. More relaxed. He explains and demonstrates so you really get it. He tells you to practice a lot so you can progress faster. Check it out if you want to learn - nice shop! Good Session! ...."
Lessons last approximately 2.5 hrs. Ask about our lessons for groups and businesses. 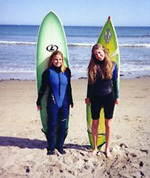 Santa Cruz Day Surf Camps. 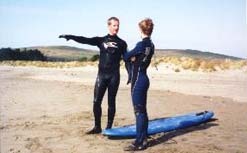 First Aid Certified Instructors, Wetsuit, Board, Transporation, Breakfast, and Lunch. Life Guard approved.